Surely They Can't Screw Up Easter Eggs? Whilst the Easter Egg has yet to disappear from our shelves (although it is probably only a matter of time before some greedy corporation decides they can make a greater profit by selling some other chocolate based product at that time of year), the confectionery multinationals have all but wiped out the last reamining childhood thrill from these chocolate eggs; cracking open the egg to find another, tastier chocolate treat inside. Easter. A time of birth. A time to celebrate the coming of new life, both religously and spiritually. A festivity passed between generations for almost two thousand years. And the symbol chosen to celebrate this new birth? The Egg. A simple shape, that has been the giver of life to many creatures since the dawn of time. This precious, nurturing coccoon, protecting the young and helpless until one day they are ready to make the final brave step by breaking the shell and venturing forth into the world as a new life. 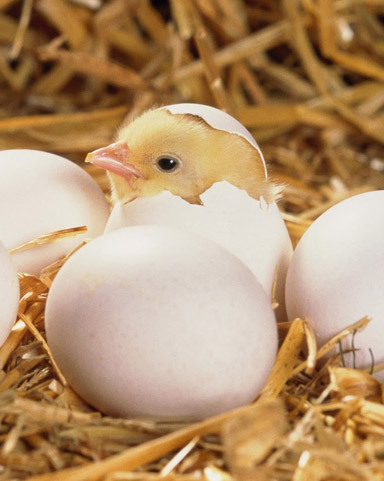 The contents of the egg are the very essence of life itself. So why the f**k have Easter Egg manufacturers started packaging the chocolate treat, the one true symbol for the birth of a new life, OUTSIDE the egg??! Yet again, it is another example of the corporate masses treating the consumer with no respect. It is an opportunity for them to create generic egg boxes, with generic plastic inserts, and generic foil wrappers to enclose a generic egg and then simply stick any old chocolate bar alongside it in the box in a pathetic attempt to fool the public into thinking they have a fantasic range of unique products, that has been lovingly crated for the benefit of the consumer, when in fact anyone with an IQ above their shoe size realises it is just an egg with exactly the same chocolate bar they can pick up in the dingiest of corner shops, 365 days of the year. The only people that benefit from this are the chocolate manufacturers themselves who save on costs, so they can generate bigger profits because they only have to make one box, one plastic insert, one foil wrapper and one egg and only have to pay for one machine to do each job. Could someone please explain to these brainless, corporate morons, the point of Easter. All about the celebration of life, birth etc. And then someone take them along to a farm and point out that when a chicken lays an egg, the embryo is inside the egg and doesn't pop out next to it! "But consumers want to see exactly what they are getting...", argue the chocolate manufacturers. Uh why? When Arthur was six he coped OK. He knew there was a treat inside the egg. And that if the box said it was a Mars Bar egg then, funnily enough, there would more than likely be a Mars Bar of some description inside. And people have quite happily used real eggs for thousands of years without having to see the yolk first! The recent marketing of the Easter Egg is a sign of the current downfall of society. The corporations are pandering to the stupid elements of society by pointing out the bloody obvious to them. The thickies of this world cannot work out that if an Easter Egg doesn't actually show them the extra treat that makes that egg unique to all the other eggs available, then the treat must be inside. They think that there must be no treat, so will pass onto another egg, possibly from another manufacturer, and choose that one instead. Thus manufacturers cater to the lowest common denominator and drag everyone else, the intelligent elements of society, kicking and screaming down to their level, destoying the last elements of chocolate egg tradition. It is the easy option. The simple option; Instead of taking the time and effort to educate and give the stupid the gift of knowledge to bring them up to the level of their intellectual superiors who understand the concept of the egg, yet again the mindless corporate chocolate empires just dumb it down and put another nail in the coffin of our once great society. There are still plenty of Easter Eggs available that shun this evil trend and hark back the more traditional times. However these tend to be high quality, hand crafted eggs that can only be afforded by those of generous means. Sadly the very people who are most in need of such traditional values are the ones who can afford them least. But there is a single beacon of light on the horizon. A symbol that all is not lost. The Cadburys Buttons Easter Egg, a small and simple egg, right at the cheapest end of the market, still holds true to the ideals of Easter; The chocolate buttons are packaged inside the egg. Let us hope that this last mass-market hope continues to shine for many more years to come.